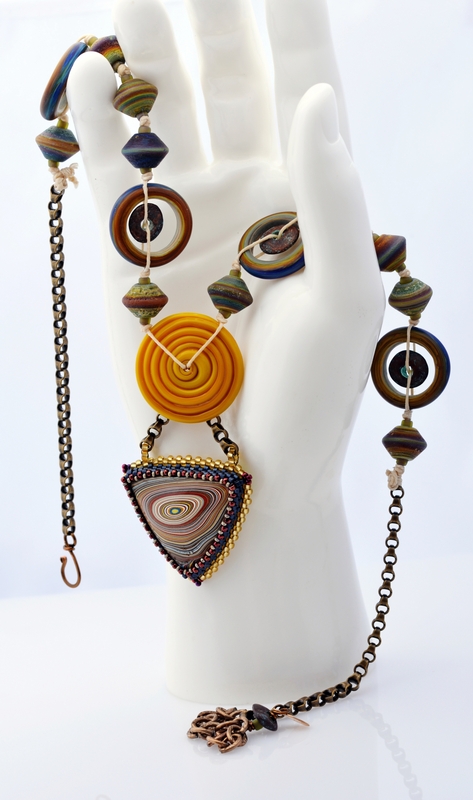 The colors and circles in the triangular Fordite cabochon inspired this colorful artisan statement necklace. It's truly one of a kind and a statement piece. 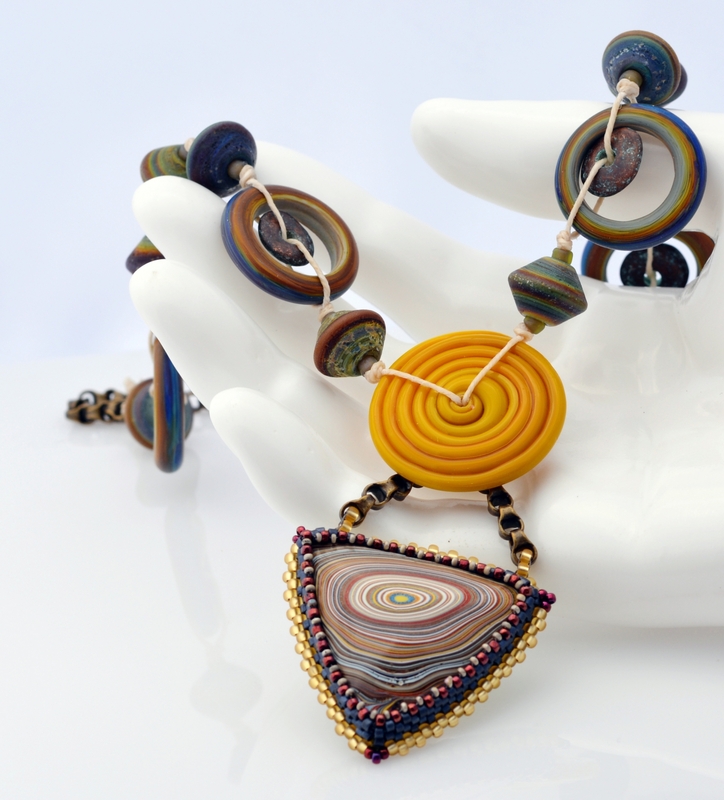 Fordite is a manmade material know also as Detroit Agate. Remember the bright metallics of the seventies? The deep reds and blues through the years? If you look closely at the cabochon you'll see those colors. Per Wikipedia: "It was formed from the built up of layers of enamel paint slag on tracks and skids on which cars were hand spray-painted (a now automated process), which have been baked numerous times." I just think it's a real fun material that will become more rare as the years go by. The colors in this one reminded me of Mexican wool blankets so that took me on this theme. I've set it with tiny Japanese seed beads against microsuede. To highlight the circle theme I dangled it from a large lampwork disc by Blue Seraphim by some cool chain. 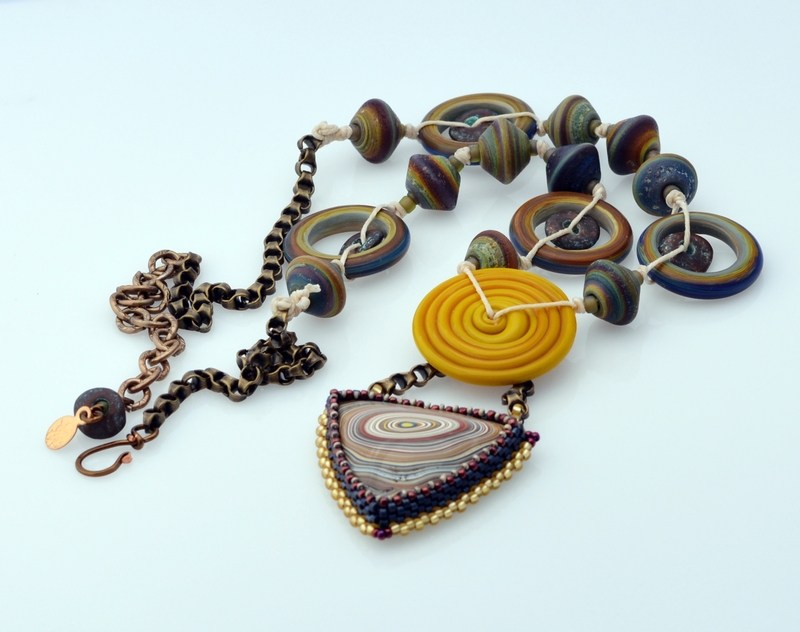 The necklace part is an abundance of lampwork by Beads of Passion. The donuts and bicones have all kinds of shades from denim blue to moss green to touches of violet and rust. They're matte finished so add a nice complement to the shiny Fordite and golden disc. In the middle of the lampwork donuts I've added ceramic discs from Greece in a verdigris copper finish. Irish Waxed Linen in a natural linen shade knots the beads together and gives a nice drape. I added more of that cool chain and some vintage chain to make this one of a kind necklace adjustable from 18 to 21 inches.